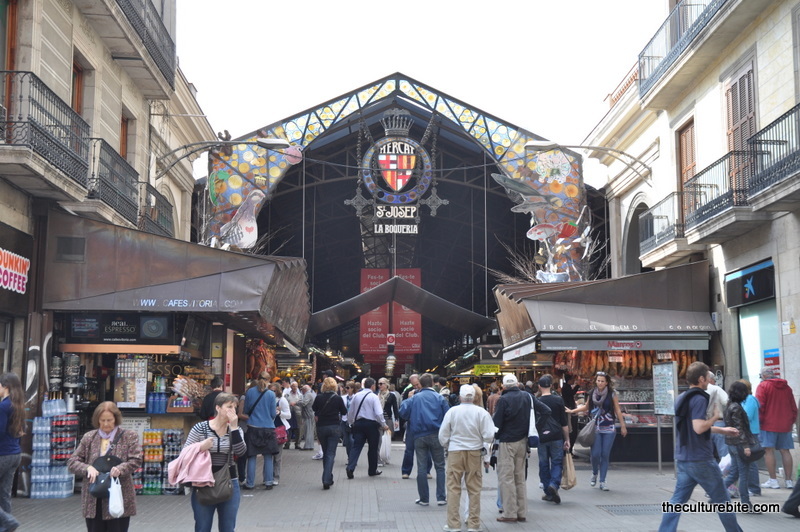 Believe it or not, there are other things to see in Barcelona besides Gaudi’s architecture. From old churches, to museums, to the ruins of a castle – this is what we did on day 8 of our vacation. It wouldn’t be right if we didn’t start the day with a chocolate croissant. So, that’s exactly what we did. We found a super cute bakery in old town and got a hot dog wrapped in pastry dough and a chocolate croissant twist. 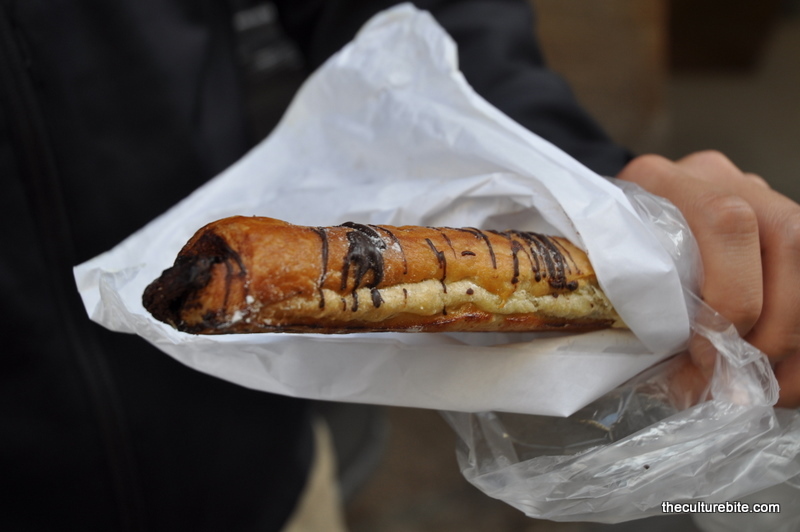 This chocolate twist was probably the best chocolate pastry from our entire trip. Soft, fluffy and filled with TONS of chocolate. Yum! 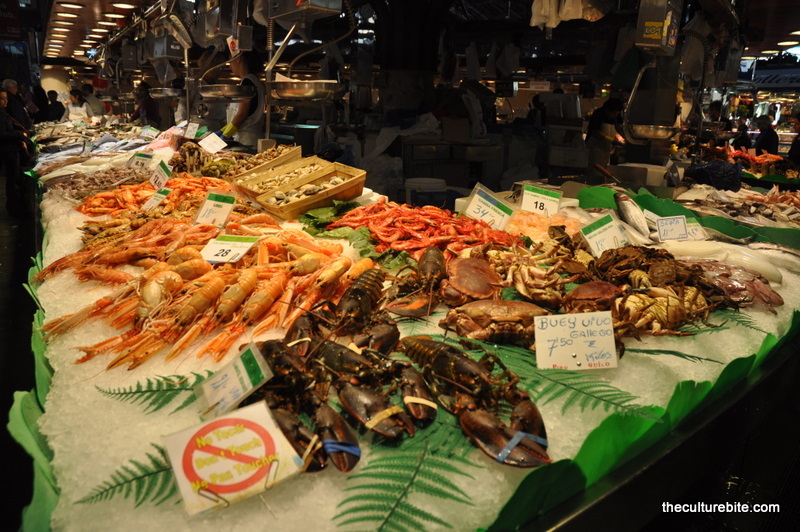 It was about lunch time after this, so we headed down La Rambla to the famous La Boqueria, Barcelona’s largest farmers market where you can buy meats, seafood, bread, and pretty much anything else you can think of. What was unfortunate was that we weren’t really hungry for a real lunch. 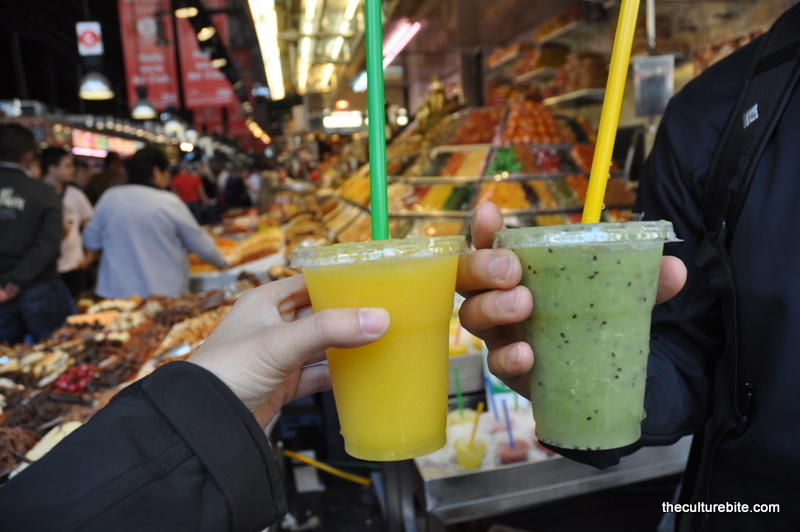 We did get fruit juice, kiwi and mango, from one of the many stands. That was thick, fresh and delish, but way overpriced. I think it might’ve been a puree of the actual fruit. 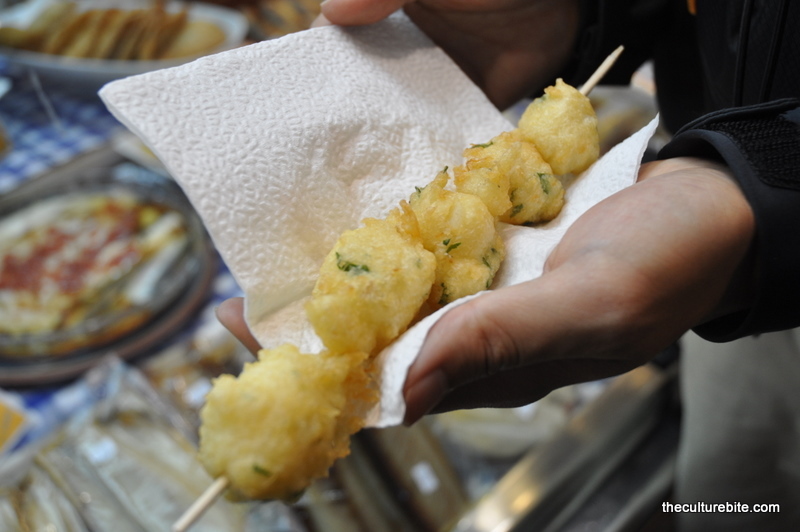 We were looking for something else small so we could say we ate here and we came across some fried salt cod at one of the seafood stands. That was really good actually. I thought I wouldn’t like it because Andrew Zimmern makes it sound so unappetizing on his show, but really it’s just dried, salted fish that has been reconstituted, battered and fried. 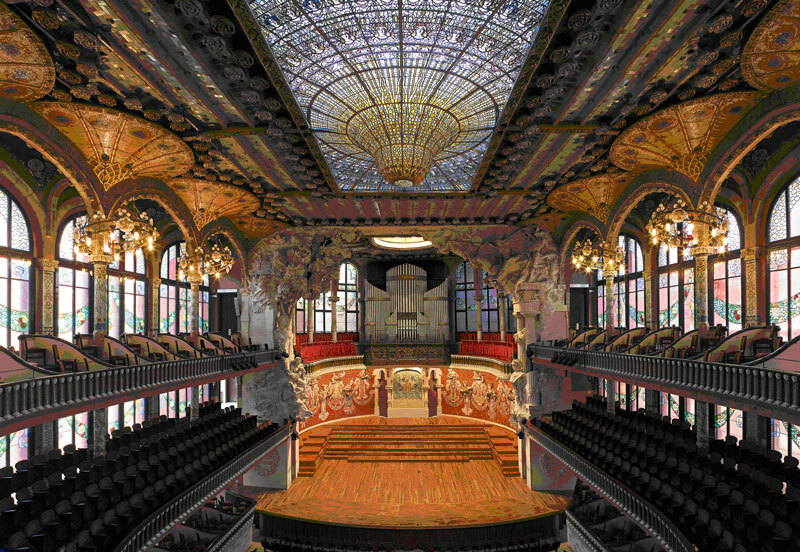 From here, we walked past the very old Gothic Cathedral to check out the Palau de la Musica, a concert hall designed by Lluís Domènech i Montaner, a rival of Antoni Gaudi. We took an hour tour inside to see the colorful glass ceiling that dips down into the hall like a raindrop, truly unique for a concert hall. The purpose of using glass in the structure was to bring in natural light. 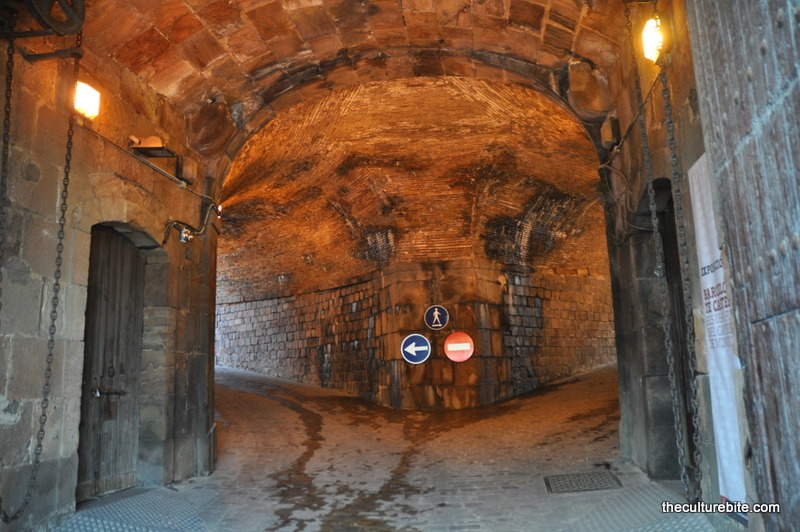 I would totally recommend this tour if you visit Barcelona. Only downside is that they don’t all you to take photos inside. I took the picture above from their website. The rest of the afternoon was dedicated to Montjuic (translation = “Hill of The Jews”). 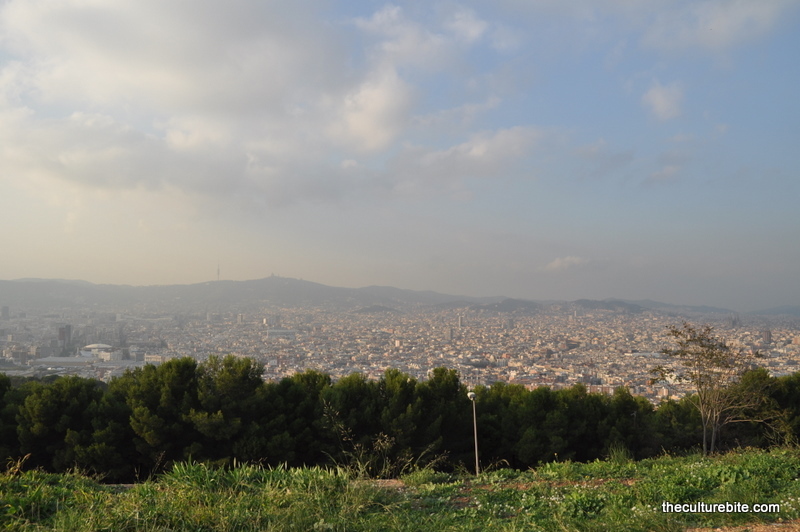 Nothing much is here besides the fact that it owns commanding views of all of Barcelona. 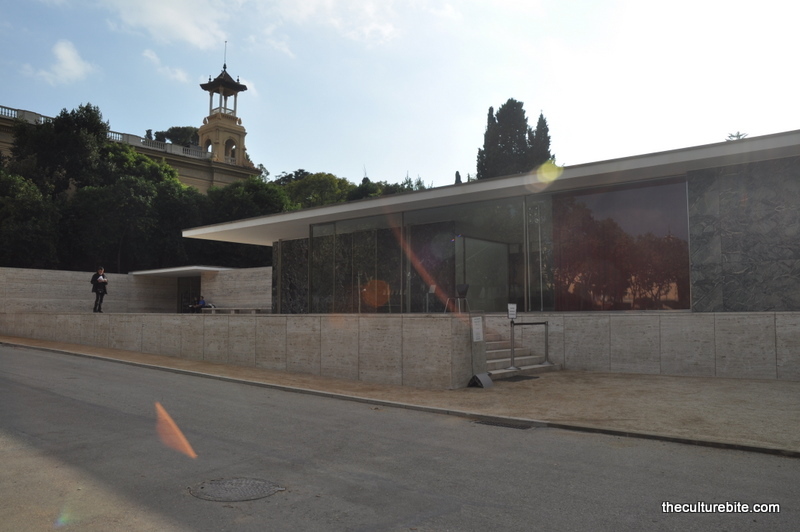 We took the metro to the bottom of the hill and worked our way up, starting with the Mies van der Rohe pavilion. 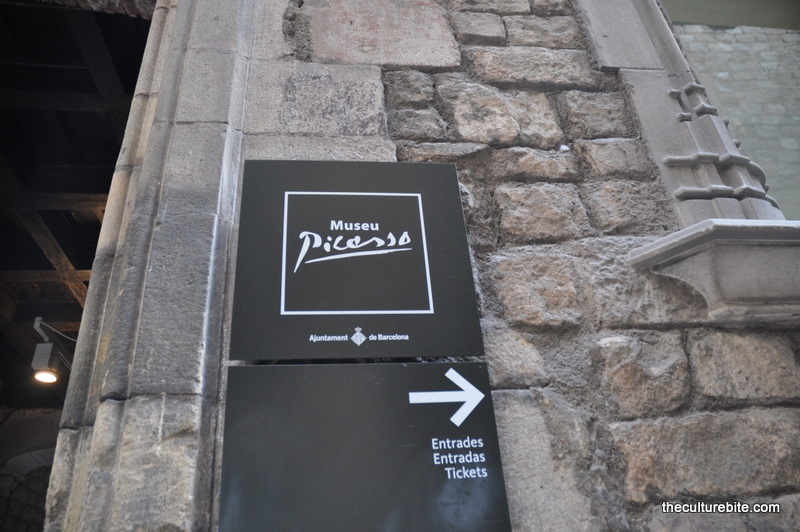 We decided to skip the popular National Museum of Catalan Art because we were a little museumed-out at the time. Entrance to the Mies van der Rohe pavilion cost us 4.50 euros each, and let me tell you, it is a waste of money. I’m a huge fan of mid-century-modern furniture so when I saw this during my research, I wanted to come here. You’d probably recognize his most famous piece, the Barcelona chair. That’s pretty much the only thing in this pavilion, 3 Barcelona chairs. Rohe did build the pavilion itself, but you can admire that from the outside. 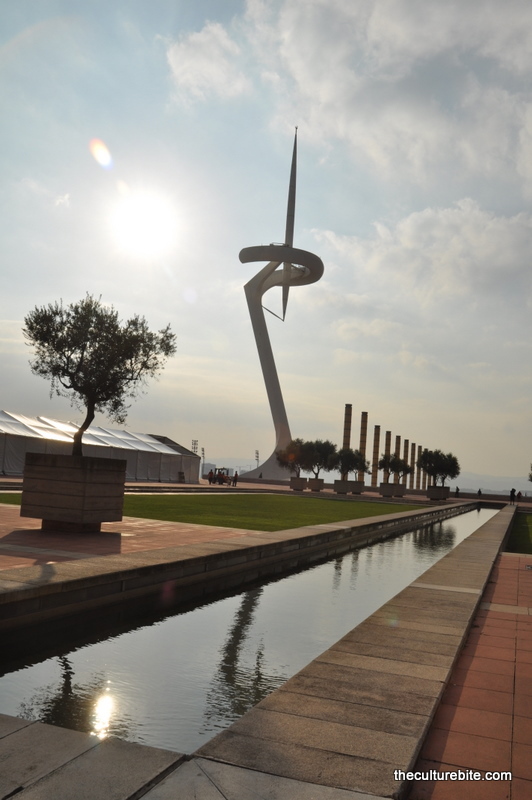 Next, we headed off to the Olympic flame for the 1992 summer Olympics. K and I thought we’d go by to check out the flame and the stadium. A few shots here and there and we were off to the next site. 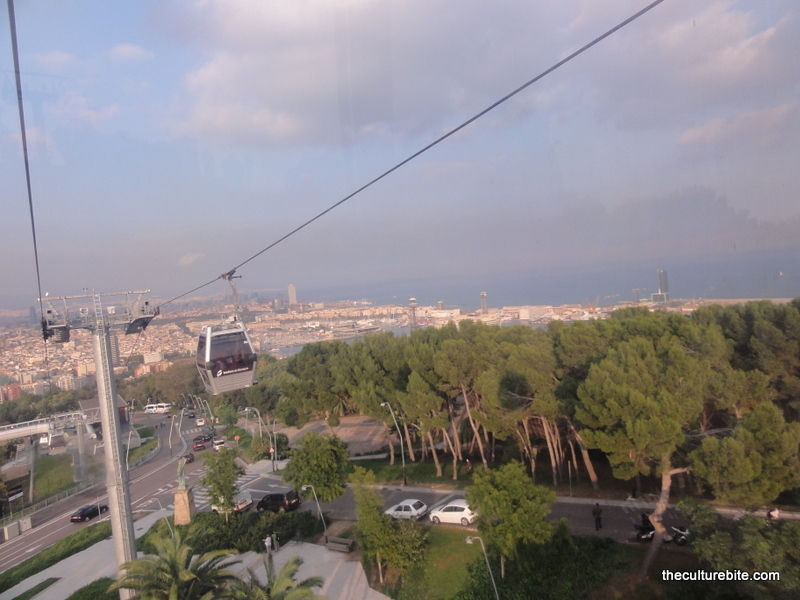 Over by the Joan Miro museum, there is a cable car that takes you up to the Castell de Montjuic. The cable car is so much fun. It’s suspended in the air and it takes you to the top of Mountjuic. 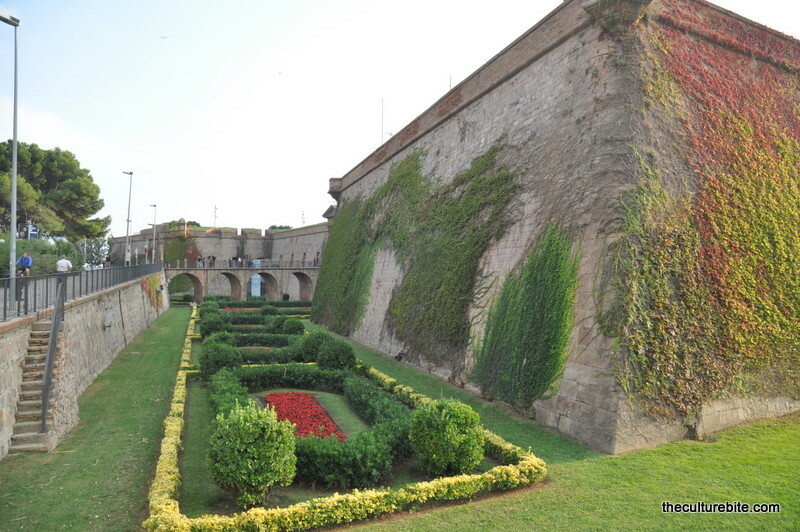 Castell de Montjuic is a 17th century fortress, but later it was used as a prison. When Franco came along, it was the site to numerous executions. The castle itself is pretty cool. There is a drawstring bridge! When you get inside, there’s really nothing to do but admire the views. On one side, you can see the harbor and on the other side, you can see all of Barcelona. From the top of Montjuic, we walked all the way down to Port Vell over by Barceloneta. 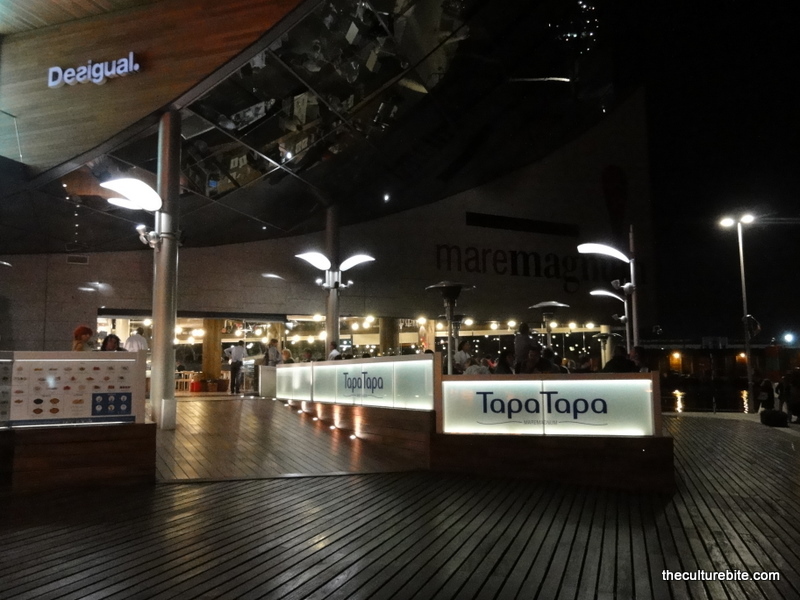 This pier was renovated for the ’92 Olympics and is now home to a big shopping center. K and I had dinner here at a touristy spot, Tapa Tapa. 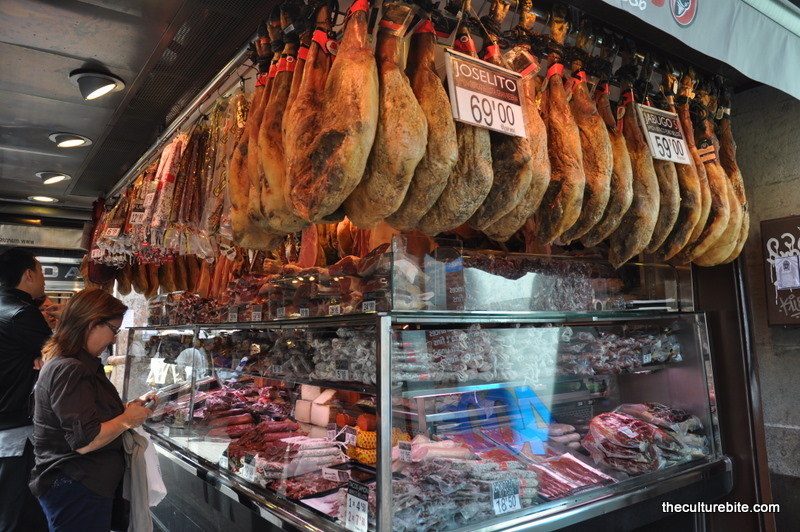 Believe it or not, but this became our favorite restaurant in Barcelona. 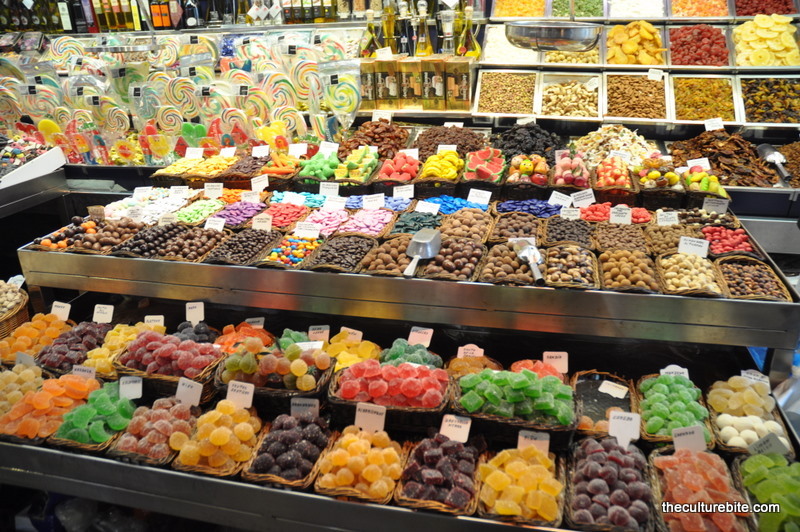 We had a variety of tapas – patatas bravas, brie and truffles on a toast, Iberian ham and cheese croquettes, and the Catalan favorite, fidua (think paella but with vermicelli noodles instead of rice). Oh man, there was not one thing I didn’t like. 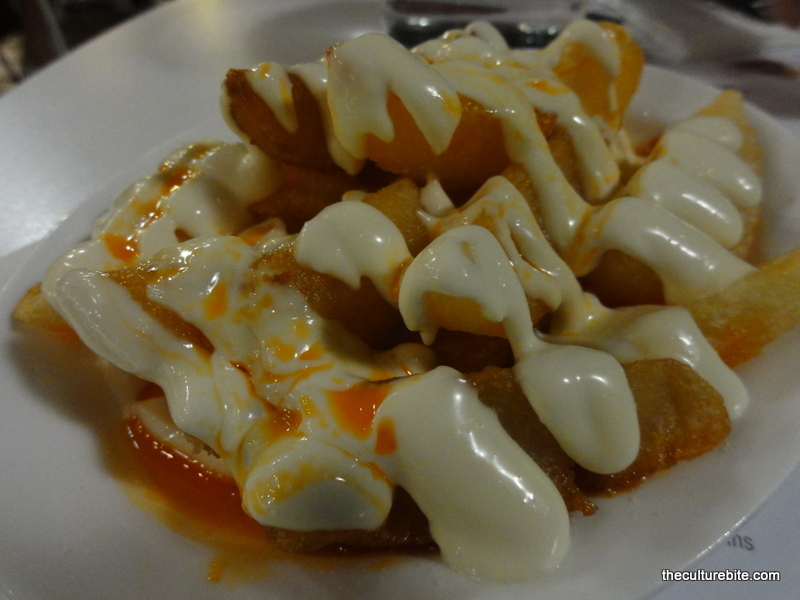 The patatas bravas were very crispy and complimentary with the spicy mayo on top. 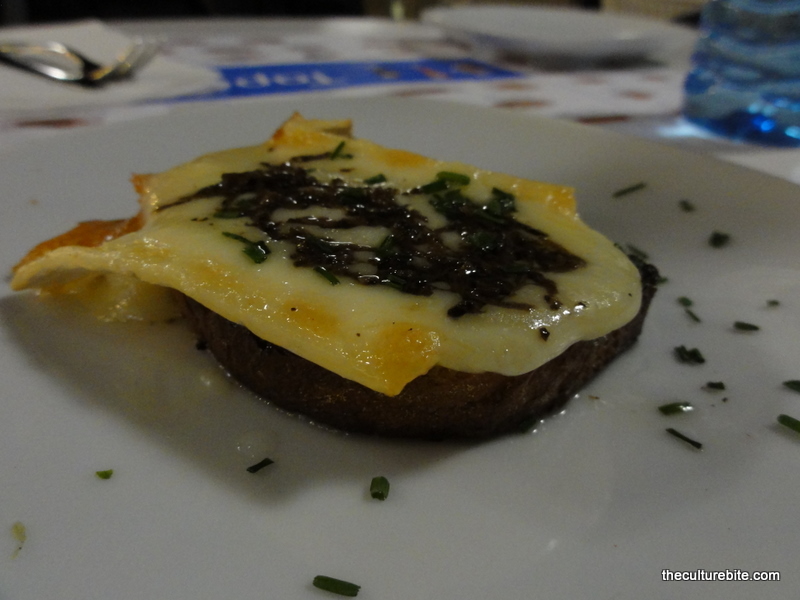 The brie and truffles on toast was hot and gooey from the oven. Who doesn’t love that? 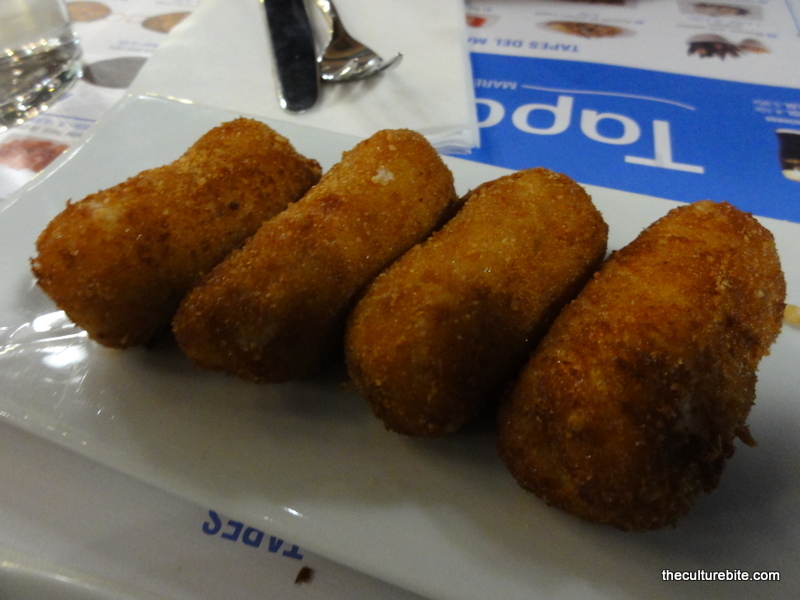 The croquettes were something new for us. A crispy breaded coating and a creamy and cheesy mashed potato center filled with pieces of salty ham. I could eat these all day and that would be dangerous. And now, the best for last – the fidua, or fish noodles. I have to find this dish in San Francisco or I may not live. 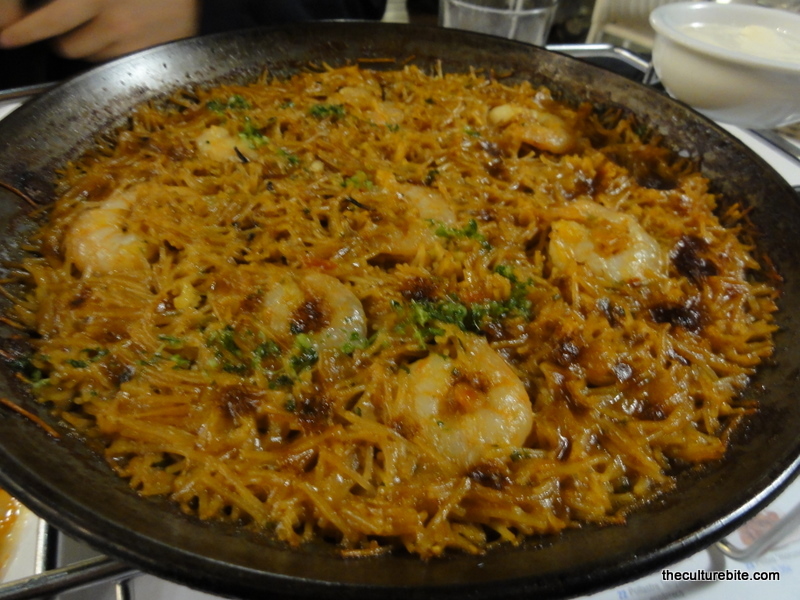 It has the same salty, saffron flavor as paella. This particular version was made with fish stock and they top it off with tender, succulent shrimp. They even serve it with a little dish of mayo. What? Why mayo? Well, I added a little dollup of it and wow. Think of all the flavors I mentioned above but in a creamy sauce. Oh, so good.